The Natural Illumination System Solatube® brings natural daylight to the inner environment of houses, commerce, and industry, without energy consumption. Solatube® is the world’s most efficient natural illumination system. Whatever is sun’s position in the sky, the system is able to capture, transfer, and spread the daylight in an homogeneous way through the whole division, or space of your house or company. 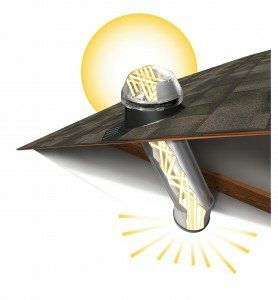 Created with a revolutionary design and cutting-edge technology, Solatube® is compounded of an acrylic dome that captures and redirects solar light to the interior of a tube coated with 99.7% reflexive material, and through a diffusing lens, the solar light is distributed to the environment in an homogeneous way. Ultraviolet rays are filtered and the heat transfer minimized. One Solatube® is enough to illuminate an area of around 46m², even in cloudy days. Solatube® is the leader product in the natural illumination systems’ market, with more than 6 million units sold in over 95 countries. 3) A light-diffusing lens that DISTRIBUTES the light in a balanced way. “Solatube® is a new tool for architects, engineers, and final consumers to include natural lighting in their environments. Among other advantages of this system, when compared to other natural illumination systems, we can point: the lack of maintenance need, as the dome in the outside is subject to an electrostatic treatment that avoids the accumulation of dust; the heat filter and UV rays, which only let light into the environment, keeping it comfortable; the possibility of directing light to the desired environment, once the system allows it to extend the light’s path up to 30 meters, without losing efficiency and the full control over the light, given that, through the lenses, it is possible to measure the illumination curves, and determine how much light is wanted before the installation.” Explains Sérgio Kanas, responsible director if Efilux – Iluminação Eficiente. Solatube® is in Brazil since 2009, being used in residences, warehouses, industries and commerce. Efilux Comércio de Produtos de Iluminação Ltda.